1. Q: Why are physician leaders in such demand? A: The healthcare system is currently in chaos. We need innovative leaders to implement this new era of healthcare reform. 2. Q: How can we best train physician leaders? A: Medical school and residency do not prepare physicians for leadership positions. They need to seek out other opportunities to hone these skill sets. The last two decades have seen an evolution fueled by preparing physician leaders for the future. The American Association for Physician Leadership was the first organization to provide any type of physician leadership training—through certificate programs—and they started this almost three decades ago. Then, slowly, universities started offering free-standing online Masters courses. As time has gone on, we’ve seen the maturation of the field of physician leadership training. It has evolved to the point where physicians can now pursue very specific Masters degrees to prepare them for leadership. 3. Q: How has the number of physicians seeking leadership roles changed? A: Dramatically. 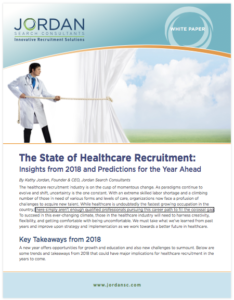 In the 1970s, physicians who were nearing retirement would seek out leadership training to transition to administration near the end of their careers. Today, physicians are well aware that leadership skills are necessary to practice medicine in the current healthcare environment. Physicians are seeking leadership positions much earlier. As a result, undergraduate medical education and graduate medical education groups and the Association of American Medical Colleges are focused on integrating leadership training into residency, internships, and beyond. 4. Q: What are the top skills and knowledge buckets that make an effective physician leader? 5. Q: What are the current challenges regarding training physician leaders? A: Business and medicine are inextricably linked. Every physician should know and appreciate the fact that healthcare is 18% of the GDP. It is a paradox…healthcare is a business, but clinical training emphasizes principles that are in direct opposition to business school teachings. As a physician, you are taught to make decisions independently and move forward, often because time is of the essence. As a physician leader, you must know how to generate consensus and consider a variety of perspectives before making a decision. 6. Q: How were you able to acquire the status of “physician leader” before it became a buzz word? A: I had wonderful mentors. I had the privilege of attending the Robert Wood Johnson Foundation Clinical Scholars Program 35 years ago. This was a program designed to take young doctors, post-residency, and expose them to the bigger questions of healthcare. This opportunity led me to pursue an MBA at The Wharton School at the University of Pennsylvania. I’ve dedicated my career to academic medicine. In 1990, I was recruited from the University of Pennsylvania to Thomas Jefferson University to create the Office of Health Policy. From there, I became a Medical School Department Chair in Health Policy. Around that time I was part of a group of a dozen or so academic physicians across the country who were talking about physician leadership. In 2008, the University board appointed me Dean of the College of Population Health. 7. Q: Do you believe we are taking the right steps to be successful in the future of healthcare? A: I don’t think anyone knows the answer to that. Only time will tell. Yes, we are taking massive steps towards more comprehensively educating physicians who have shown business and leadership interest. You can see that in the wide variety of Masters programs springing up all over the country. I believe as the healthcare environment continues to evolve so, too, will our nation’s methods for preparing physicians. 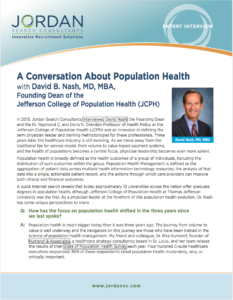 David Nash was named the Founding Dean of the Jefferson College of Population Health (JSPH) in 2008. This appointment caps a 20-year tenure on the faculty of Thomas Jefferson University. He is also the Dr. Raymond C. and Doris N. Grandon Professor of Health Policy. Dr. Nash is a board certified Internist who is internationally recognized for his work in outcomes management, medical staff development and quality-of-care improvement. He has authored more than 100 articles in major journals. He has edited 22 books, including Connecting with the New Healthcare Consumer, The Quality Solution, Governance for Healthcare Providers, Population Health: Creating a Culture of Wellness, and most recently, Demand Better. From 1984 to 1989 he was Deputy Editor of Annals of Internal Medicine. Currently, he is Editor-in-Chief of four major national journals including American Journal of Medical Quality, Population Health Management, P&T, and American Health and Drug Benefits.